But, I learned my lesson and now know to research menus online or call beforehand. I’ve never before had to think about that, because I’ve never had any sort of ‘dietary restrictions’ (minus going gluten free for a few months). It’s a new perspective to see how difficult it can be to go out for a meal, depending on how accomodating the menu, staff, and chef are. Then again, I have ‘cut’ quite a few things out of an American diet. It amazes me how many things have meat or dairy and cannot be altered because that’s mainly the meal. It’s funny how another perspective has been changing for me, too. I don’t find more that I’ve ‘cut’ things out of my diet, but that other people just add more to theirs. It may not make sense to many people, but it’s a different way of looking at it. We’ve come so far out of touch with meals that are fresh and natural, free from GMOs and preservatives and pesticides and corn. Does such a thing exist anymore? That being said, I’m becoming more familiar with my grocery store environment (I hate the grocery store), and am learning which brands I trust, which I don’t, and getting very good at reading labels and ingredients. I also am learning my way better and better around the kitchen. At 25, I don’t really cook. It’s not, nor has ever been my thing. Chopping, slicing, dicing, mixing all seem time-consuming and require a lot of patience. But, I’m getting better and coming to terms with it. Baby steps. I have managed to stumble my way through some recipes, and even (kind of) come up with my own. These have pretty much everything but the kitchen sink in them (yay awkward American expressions!). I literally took out almost every vegetable in my refrigerator for the taco/fajita filling. I started by sauteeing onion, garlic, and asparagus in some olive oil. After those became soft I added red, orange, and yellow bell peppers, serrano peppers for some spice, shredded zucchini, crimini mushrooms, black beans, corn, cilantro, and a whole mess of spices (use your favorite taco or fajita blend). While I let that all marinade, I chopped up roma tomaotes, avocado, and lettuce for toppings. Additionally I made a creamy sauce with vegan mayonaise, cilantro, lime juice, crushed red pepper, black pepper, salt, and probably something else I don’t remember (I got the idea from one of my recipe books). They may look a little grey and bland, but these guys are packed with flavor! Use you favorite veggies, or whatever you have in your fridge — they went over extremely well with friends. No meat and all. A Colorado March winter day, with 6 new inches of snow calls for a big bowl of chili. I found this recipe and was sold. This was also modified, of course, by adding a ton more veggies, extra beans, and an extra can of diced tomatoes. That means it needed extra seasonings. Taste test to your liking. I don’t really drink milk in the first place. I’ve been using almond milk for a very long time. For my boyfriend, who’s doing this challenge with me, that has been the most difficult thing to give up. As a frequent milk drinker, he’s finding that other forms of milk don’t really compare; they don’t taste the same. I happen to LOVE almond milk, but he has a little more difficulty adjusting to different foods. When it comes to milk, there are a few things that really stick out to me: we are the only species on the planet that drinks another species’ milk. I find that a little odd. Don’t get me wrong, I was raised on it and don’t have a problem drinking a glass now and then, it’s just not something in my every day diet. 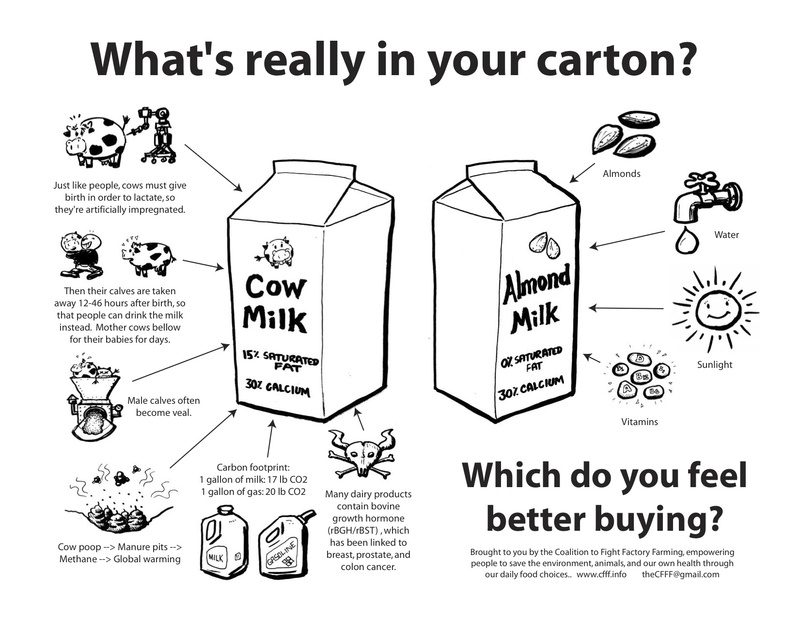 While there may be health benefits to a glass of milk a day, there are also cons, including a high carbon footprint, how you actually get your milk, what’s done to it, and what’s done to the cows. I’ll get off my soapbox now. Wow. What a crazy world we live in. This film will not tell you what to eat. This film will tell you what you’re already eating. And that’s even worse. It’s not made to push vegetarianism or criticize someone for eating veal, it’s made to tell you about the food monopoly that we’re encouraging on a daily basis. It’s an industry that compromises food and the best interests of the people by making nutritionally void, chemical filled, artificial flavored meals more affordable than a head of lettuce. And it’s doing it one conglomerate at a time, putting the local, independent farmers, who can actually produce fresh, natural, good-for-you food, out of business. The average supermarket has over 47,000 items on the shelves. Over 70% of those have corn in them. A chicken can be born, raised in a pitch black environment, loaded with meds and antibiotics, and butchered and ready to eat in 49 days. That’s a month and a half, folks. Their breasts grow so large that they cannot physically walk during their 49-day lifespan. A fast-food hamburger can contain meat from up to 100 different cows. Bettie, Bessie, Barney….. Cows are not meant to eat corn. They are meant to eat grass. Because corn is cheaper and more easily disposable, that’s what they are raised on. In doing so, their stomachs cannot digest the corn, and their stomachs become breeding grounds for E.coli bacteria. The solution? Washing beef in ammonia and chlorine to destroy these bacteria before they are sold to grocery stores. The kicker: it would take only 5 days of feeding grass in place of corn to kill nearly all the E.coli bacteria. We are training fish to eat corn. WHAT?! The USDA is allowed to regulate what constitutes organic food and when your milk is past due, but it does not have the authority to shut down a meat plant if they are selling tainted meat. Food, Inc. took 6 years to produce. In that timeframe, Robert Kenner attempted to interview 50 of the largest food producers in America. Not a single one agreed. These include Tyson, Smithfield Farms, and Monsanto. I have a newly found appreciation for local farming and intend to do my best to get my hands on independent farmer produce. Quality over quantity and local community support. I’m all for it. This vegan adventure definitely hit home for me this past week between learning where I can and cannot go out to eat (and knowing I have to do my research), to understanding the importance of local farming and where your food is truly coming from. We don’t live in a perfect world, but we can do our best to make adjustments toward a healthier one. This entry was posted in Cooking, Entertainment, Inspiration, Recipes, Trial & Error and tagged adventure, challenge, cooking, homemade, inspiration, new experiences, recipes, trial & error, vegan diaries. Bookmark the permalink.